The crafting system in Diablo III uses NPC Artisans to manufacture new, semi-random items from salvaged materials. This system allows players to essentially gamble for new gear, potentially creating some of the best items in the game. 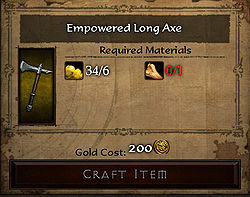 Crafting is a major part of the game economy, creating a useful purpose for all of the extra items and gold that players will accumulate over time. Players begin crafting early in the game, and continue doing so as their characters grow. Crafting remains useful in the end game when the highest level crafting recipes will be rolled over and over again, by players hoping to score great mods from the Random Properties in all crafting recipes. Watch Blizzard's Artisan video for a visual introduction to Crafting. All crafting is done through the Artisans, two new NPCs who are found in the town, or Caravan area. The caravan travels with the player all through the game, so the same NPCs will be found in each act. The two artisans cover different aspects of items, and they will be large parts of the game's plot and quests as well, with information to share about all sorts of things encountered during the course of the game's four acts. New characters do not start off with Artisans; both are encountered during the course of playing through Act One, as NPCs with quests that they need assistance with. Once the player completes their quests, the Artisans join up on your journey, out of loyalty or simply a desire for profits. Artisans start off as apprentices (level one), but they can be trained up to level five, gaining more abilities and learning many new recipes as their level increases. Haedrig Eamon is the Blacksmith. The first artisan encountered, Haedrig's family was killed and zombified, and he needs your assistance in putting them to rest. Once that's done, he joins the Caravan. Haedrig handles salvaging, repairs, and buys and sells most every type of weapon and armor. His crafting recipes are all weapons and armor. The Jeweler, Shen is a greedy fellow, who requires assistance obtaining a valuable jewel from a fearsome demon. Once that's given, he joins the Caravan, offering item socketing, removing Gems and upgrade the quality of your found gems. Materials are required for all crafting recipes. Materials are obtained through the Salvage tab in the Blacksmith's interface. He will salvage all armor and weapons, giving materials which stack up in the character's inventory taking up very little storage space. Salvaging items will give materials of the same type. In Patch 2.3, the level 1-60 tier of materials will be removed. Dragging the item to the Anvil in the Blacksmith's Salvage tab. Click on the anvil in the Salvage tab and then left click on the items in your inventory to salvage. In Patch 2.3, Kanai's Cube adds new recipes that require new Materials. These materials are found from the Horadric Caches award for completing 5 bounties in an act. To craft items, select the crafting interface from any Artisan's options menu. The available recipes will display in a long list. Hovering on a recipe will expand it, showing the required ingredients, as well as a preview of the potential item. All recipes include one or more random properties, which is what makes crafting a long term activity in the game. There's no telling what modifiers will spawn in those spots, so while there's some predictability to crafted items, there are thousands of potential items that can be created from each recipe; as many as there are modifiers in the game. 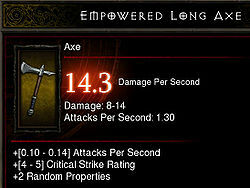 Empowered Long Axe potential item. The recipe is seen here on the left, with the resulting item to the right. This one would make an Empowered Long Axe; a decent weapon for a low level Barbarian. Crafting items requires the right materials; in this case 6 common scraps, 1 bone, and 200 gold. Materials are the raw ingredients obtained by salvaging items in the salvage cube. Artisan training is quick also, once your character has obtained the materials and gold to pay for it. Jay Wilson: One of the key elements of crafting is that to acquire the best stuff you need the recipes to make them. and recipes drop. You might find those from final bosses in hell difficulty. It is our goal that some crafted items are viable as top tier items. we don’t want crafting to dominate. If anything, we’ll make them the smallest percentage of the items. But we do want to make some crafted items obviously the best in their area. So that when you get a max level char, they’re not wearing just rares/legendary/crafted. But a mixture. in.Diablo.d3: If Artisan items are that great, can they be created in bulk and traded and passed around? Jay Wilson: The problem with that idea is that the D3 crafting system produces random items. So there won’t be high end crafted items that don’t have completely random properties. Crafting is more like gambling was in D2. You know what type of item,but not the mods. So even the uber recipes you’ll have to make a ton of them to get one that’s really good. Even if crafting does make a lot of great same type of item, it would just devalue it since other people could probably do the same thing. We don’t think that’s a problem as long as crafted items are a small % of the overall high end items. 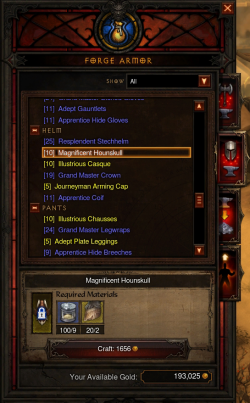 Diablo III's item crafting takes Diablo II's crafting system and expands upon it. The same basic mechanic exists; crafted items are a predictable item type, and they have preset mods that will vary within a slight range, while bonus modifiers are tacked on to make or break the item, quality-wise. Diablo III adds a lot to it, of course, combining elements of gambling, as well as item recycling and creation to the process. There are hundreds more recipes in Diablo 3 than there were in Diablo 2, plus the rare recipes that can only be obtained as item drops from monsters. The Artisan interactions are all new as well, with their quest and story input adding to the game. They make crafting much easier as well; players have all they need to know in the game; there's no need to print out or memorize crafting recipes from websites. Crafting is much easier in Diablo III as well, since the items are created from materials. Diablo 2 required players to find an item of the type they wanted to craft, which the recipe would then reroll. That was easy with rings and amulets, but other recipes required a specific quality or types of boot or glove or other item, plus high level gems, which took time to create. This page was last edited on 22 July 2015, at 15:40.